Michael Bennison, our 1st prize winner and Bill and Bonnie Waldron who split the 2nd prize, are very glad they bought tickets last year as they were our top two prize winners. Tickets are available at Notre Dame Jr./Sr. 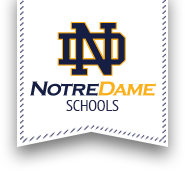 High School at 2 Notre Dame Lane, Utica, NY 13502, with your $80.00 donation. For further information or more applications, please call (315) 724-5118. Donation for each ticket is $80.00. More than one name may be on a ticket. Drawing Party will be held on Sunday, April 30, 2017, at Notre Dame Jr./Sr. High School. Doors open at 12:30 pm. Only two (2) adults per ticket will be admitted to the Drawing Party. Free and unlimited food and beverages will be served; special door prizes will be drawn. Must be 21 years old or older to attend. Drawings will begin at approximately 3:00 pm with the 17th prize drawing and end with the first prize of $50,000. Every winning ticket is thrown back into the drum so that you can win more than once on the same ticket! Requests for Lucky or Special Numbers (between 1 – 2000) will be on a first come, first serve basis. If all 2,000 tickets are not sold by the day of the drawing, the drawing will go on as planned; however, prizes will be 50% of the ticket money collected and distributed on a prorated basis (see back of ticket application for prorated details.) Any number of people may purchase a single ticket; however, due to space limitations, only two adults may attend the Drawing Party on a single ticket. YOU MUST BE 21 YEARS OF AGE TO PURCHASE A TICKET. Anyone who purchases a ticket(s) by February 1st will be eligible for a special drawing. All tickets sold by that date will be entered for five (5) $100 prizes. Winners will be drawn at the February Raffle Committee meeting. All prizes will be mailed to the five lucky winners.